As a follow up to my post this past Sunday on the Australian government's attempts to control white sharks off the Western Australian coast by a variety of often fatal means, new research has come out regarding another avenue for developing a shark repellent: Eyesight. 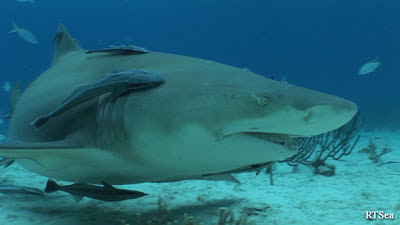 According to RedOrbit.com, researchers from Australia have been studying the brains of cartilaginous animals, which includes sharks and rays, and their conclusions point to some species of shark as having a more developed brain than previously thought. There isn't an implication that the sharks are "smarter" than previously thought, as that often implies intelligence of a sort that we associate with humans. Rather, while some sharks have developed brains along an evolutionary path that is similar to vertebrates including humans, the sensory abilities of the sharks are perhaps broader in scope and therefore can have an impact on their behavior more than previously suspected. While chemical shark repellents have focused on confusing or disrupting a shark's sense of smell, the new research poses the idea that visual cues might serve as effective repellents. “Great white sharks have quite large parts of the brain associated with their visual input, with implications for them being much more receptive to repellents targeting visual markers,” said Kara Yopak, a shark researcher at the University of Western Australia. And what visual image would a shark possibly find threatening or repelling? Imagine that the ultimate shark repellent turns out to be a black and white striped banner with the words "This is a giant sea snake. Go away," emblazoned across the front. Or perhaps we scuba divers will all start wearing wetsuits with markings that look similar to orcas - a known shark predator. Anything is worth a try when the alternative is hooking and killing any shark that happens to cruise within the vicinity of a popular beach.